The Consumer Product Safety Commission estimated that “3,300 children aged 5 to 14 were treated in emergency rooms for injuries related to book bags”. 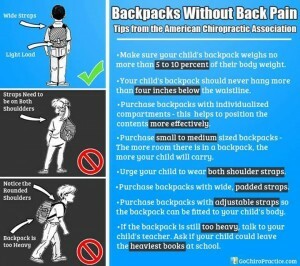 Dr. Russell Brokstein, DC discusses how to prevent your child/children from injuring their spines with their backpacks. Repetitive postural strains your child experiences today can have a dramatic effect on the health of their spine for many years to come. Early arthritis, disc degeneration, as well as pain and dysfunction can come as a result of what your kids do now. Summer is winding down and in some parts of the country kids have already gone back to school and in other parts they are getting ready for the start of school. Getting new school supplies and equipment is well under way! A major thing to consider is the weight of your children’s backpacks. It’s important to get a backpack evaluations. Too many kids experience back pain due to the wrong type of backpack and the way things are put in the backpack. Too much weight in a backpack can cause back pain, neck pain and shoulder pain. Guidelines state a backpack shouldn’t be more than 10 to 15% of the child’s weight. Studies show kids with back pain develop chronic conditions through their adult life. This is why it’s important to have backpack evaluations. It is a simple step to stop and prevent pain early. 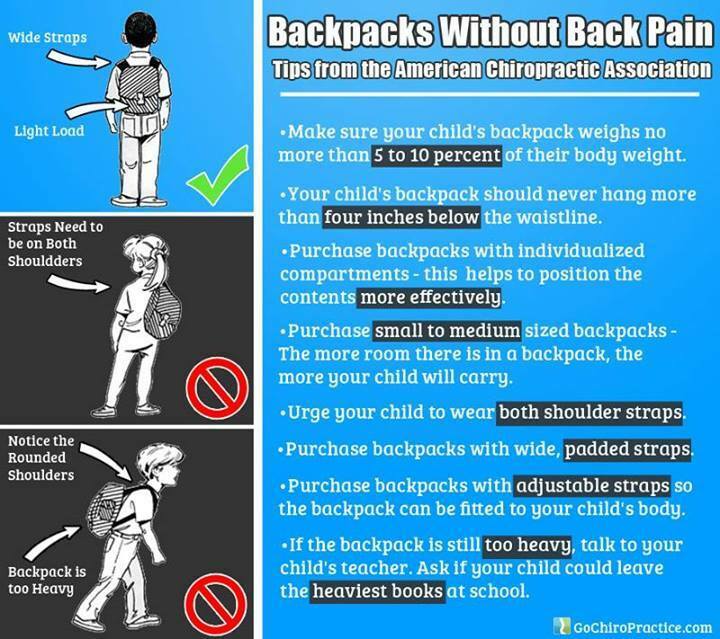 The journal Applied Ergonomics recently published research about the prevalence of back, neck, and shoulder pain in 586 schoolchildren aged 12-14 years carrying on average about 6lbs in their backpacks. One of the concerns of the study were if gender affected the outcomes. Variables measured were the children’s weight, height, BMI, and the weight of backpacks. Also documented were they type of bad they used and how the children carried their bags: over one shoulder, over both shoulders, or grasping it by their hand. The majority of kids (59.6%) reported some type of neck, back, or shoulder pain. More than a third of children (35.3%) reported neck pain, more than a quarter of kids (26.2%) had low-back pain, and 33% of children had shoulder pain. Results from the study show neck pain was experienced more by children who carried their backpacks for more than 20 minutes or their bags were heavier. Low back pain was more in those using a backpack versus those using a briefcase or satchel. There is only a slight increase in risk of pain by the children carrying their bag by their hand or over one shoulder. The most significant finding of the study was gender being an independent factor predicting musculoskeletal symptoms in schoolchildren. Girls experienced neck pain, back pain and shoulder pain twice as much as the boys regardless of the other variables. Other studies also show girls have a higher risk of musculoskeletal problems from use of schoolbags. The guidelines for backpack safety should be modified based on gender and used for backpack evaluations.